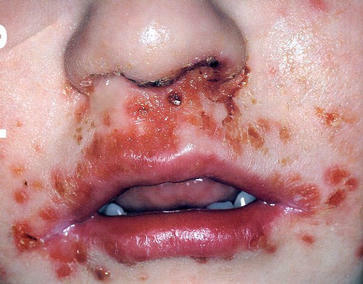 This is a bacterial infection of the skin that is very common in children. It gains access through damaged skin, such as cuts, grazes or insect bites. If there is direct skin-to-skin contact with others, or if bedding, clothing or towels are shared, it can spread rapidly through families and communities. This rash can occur anywhere on the body, but most frequently on the head and neck. The area should be gently cleansed with soap and water to remove the crusts. An antibiotic should be obtained from the surgery, sometimes a cream which is applied three times daily for a week, but more often oral antibiotics (e.g. flucloxacillin) should be given. Children should be kept away from school or nursery for a few days after starting treatment and should not share towels or bedding etc with others. 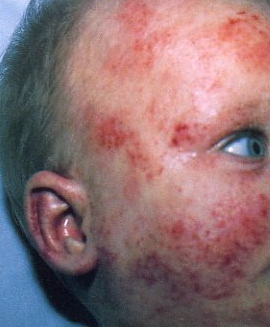 Atopic (allergic) eczema is common in young children. A bacterial infection frequently develops, which often accounts for a sudden flare-up of the eczema. In some cases, small yellow crusting lesions appear which is an impetigo of the eczema. Topical or oral antibiotics will be needed to control this condition. Sometimes this is given as a cream or ointment combined with a steroid to treat the inflammation. This is a fungal infection. In children it most commonly affects the trunk and limbs (tinea corporis), the scalp (tinea capitis) and the feet (tinea pedis - athlete's foot). Preventing the infection is by avoiding skin-to-skin contact with the infected indvidual. This can occur in any age, but is more common in children. This is usually a topical anti-fungal in the form of a cream, ointment, spray or powder. In the case of scalp ringworm or for widespread problems, oral treatment is sometimes necessary. Oral thrush (pictured) is frequently seen in new babies, when the immune system is still developing. It can be caught from the mother during a vaginal delivery. The child may have feeding problems due to pain and soreness, and you may see creamy white lesions as shown in the mouth and on the tongue. This is usually with antifungal mouth drops or gel applied directly to the lesions in the mouth. Continue with treatment until 2 days after the infection has cleared. The warm and moist nappy area is ideal for thrush to grow. This will present with a red and angry nappy rash that involves the folds of skin. Non-thrush nappy rash usually spares the folds of the skin. The child will also often have oral thrush. Use a topical anti-fungal cream or ointment after each nappy change. You can buy these over the counter in pharmacies. Allow as much time without a nappy as possible. Sometimes a 'top and tail' approach is needed with an oral treatment as well. 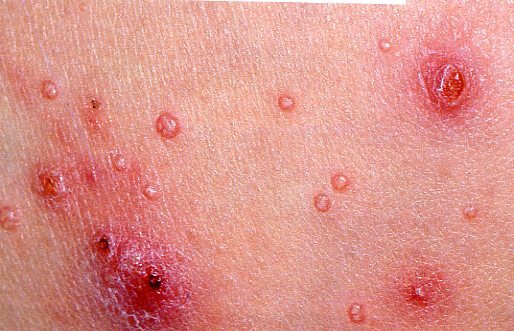 Warts are caused by a virus and are extremely common in children. They are spread by direct contact, or if scratched they may be spread to other parts of the body. Warts may take up to a year to disappear, but they will eventually go without treatment. They can occur on any part of the body, but are commest on the hands, feet and knees. Pictured above is a verruca (a type of wart). Nearly all of these lesions will clear in 2 years. There is no need to treat unless they are causing problems. There is a possibility of transmission in communal swimming pools or gyms. 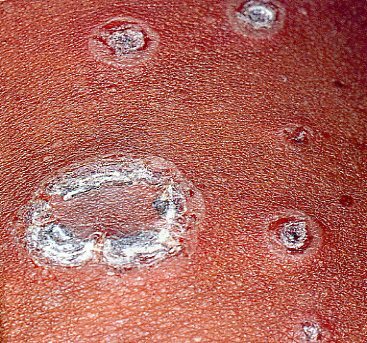 The department of health recommends that children carry on with swimming when affected by warts, but to cover up the lesions. 1) Cover the lesion continously (24 hours a day) with sellotape. 2) Chemical preparations e.g. salicylic acid, which can be bought over the counter. The hard skin should be pared or filed prior to application of the chemical on a daily basis. 3) Freezing with liquid nitrogen - not routinely available in Dudley, and no more effective than chemical agents. 4) Surgery has been tried, but recurrence is high and scarring will occur. This infection is caused by a virus. It commonly occurs in children. It is spread by direct contact. The lesions are painless and may be single or multiple. They occur on any part of the body, but not the palms and soles. They can be more widespread in those patients with eczema. No treatment is necessary. These lesions will resolve by themselves in a few months. This condition is harmless. Advice presented on this web site is for information only and is not intended as a substitute for seeking professional medical advice. Links to other web sites are offered for information only and this practice does not endorse any other web site.